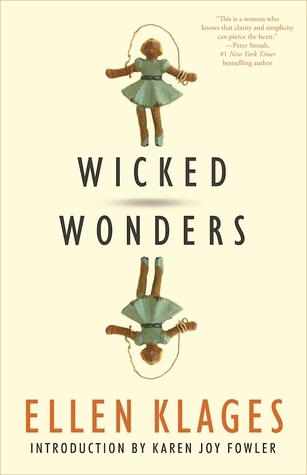 In Wicked Wonders, Ellen Klages’ new short collection, women usually take center stage: young girls idolize villains, an astronaut finds out she’s pregnant while heading to Mars, a young student falls into living board games and must figure her way out. The stories often fall onto the side of the fantastic, but they also look at real dynamics of womanhood: friendships, relationships, work. All of these things are things that draw me in normally. Dynamics of gender, especially when speculative elements come with them, are some of my favorite things to read. However, something in Klages writing managed to push me away. I kept wanting to like these stories far more than I liked them. The ideas and relationships in them feel more surface level and oftentimes I found myself unable to connect with the characters or their emotions. It’s hard to pin point exactly why, though. In the opening story “The Education if a Witch,” a little girl becomes obsessed with Maleficent at the same time that her family welcomes a new baby. The story is dark in the right places but always feels like its holding back a little too much, even as the ending becomes more sinister—it still feels uncomfortable with its own darkness. In another story, “Goodnight Moons,” a female astronaut discovers she is pregnant and the media storm around her pregnancy means she has to keep the child—on Mars. I wanted to love the story so much: female astronauts, agency of women and their bodies, Mars. Yet, again, the story felt a little too neat and tidy and, dare I say, sweet? That sweetness might be what keeps me from enjoying these stories. Every one of them feels safe and many feel sweet. I’m all for kindness and empathy towards characters and their situations in stories. But Klages takes that one step further and seems to go around any sort of depth, danger, or dilemma. While on the surface level, these stories can be enjoyable enough, they won’t be ones you return to over and over or think about later.